People generally enjoy showing pictures of places they have visited and things they have seen. Simply telling someone about a trip, say, to Sequoia National Park, is one thing; showing that person a picture of you standing next to the largest tree in Sequoia National Park, named General Sherman (which also is the largest tree on the planet), is entirely different. As the old adage goes, “a picture is worth a thousand words.” People constantly take pictures of things they want to share with others. Someone on a safari in Africa may bring home pictures of an elephant he saw in the wild. Visitors to the islands of Indonesia delight in showing pictures they took of real komodo dragons scurrying across the ground and up trees. Tourists in Alaska often are seen on roadsides capturing moose, dall sheep, and even grizzly bears on camera. Why? There are several reasons, but for many people it is to show others what they have seen. Pictures also authenticate the stories we tell. Humans not only have told stories about large reptilian creatures (i.e., dragons/dinosaurs) for millennia (Lyons, 2007, 29:65-71,73-79), the ancients also left behind “pictures” of these animals: some with serpentine necks, stout legs, elongated bodies, and enormous tails; others with knobby heads, short necks, plated backs, and spiked tails. Of course, these pictures are not the kind we take today, but paintings and carvings on rocks, in caves, on pottery, etc. Like the deer, goats, monkeys, mammoths, and other animals that have been discovered around the world carved or painted on rock walls by the ancients, various ancient “pictures” of dinosaurs have also been uncovered. If humans really did coexist with these animals at one time, such pictures are exactly what one would expect to find. The Khmer civilization once flourished in the Southeast Asian territory of Angkor. Hindu and Buddhist kings during the 8th through 13th centuries A.D. built majestic stone temples throughout the area (NOTE: Information about the Khmer civilization, its rulers, and temples is derived from Freeman and Jacques, 1999, unless otherwise noted). In approximately 1186, King Jayavarman VII undertook the building of Ta Prohm, a stone monastery/temple. The ruins of Ta Prohm, which stand today in the overgrown jungles of Cambodia, were chosen by one of the major preservation societies “to be left in its ‘natural state,’ as an example of how most of Angkor looked on its discovery in the 19th century” (p. 136). Intricately carved statues and stone columns fill the temple-monastery. On the stones, the ancients depicted animals, people, gods, various plants, and a host of other decorative images. But one column of carvings maintains a special interest to those interested in dinosaur/human coexistence. Concerning this particular column, Freeman and Jacques wrote: “On the angles and corners of the porch are numerous small scenes and representations of animals, both real and mythical” (p. 144). 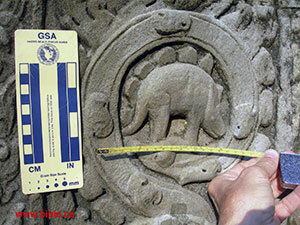 Of special note, the authors wrote about one of the carved animals, saying: “Among the vertical strip of roundels in the angle between the south wall of the porch and the east wall of the main body of the gopura there is even a very convincing representation of a stegosaur” (p. 144, emp. added). In their other book on Angkor, Jacques and Freeman were even more emphatic, saying that the animal “bears a striking resemblance to a stegosaurus” (1997, p. 213). lived in Cambodia for nine years where he taught Khmer history at the Archaeology Department of Phnom Penh and pursued his research into Khmer civilization. He has been the Director of Studies at the Ecole Pratiques des Hautes Etudes for the last two decades, teaching the history of Southeast Asia. He is an expert in Sanskrit, Khmer and Cham scripts and is closely involved in the various restoration projects being [sic] at Angkor (1999). has been photographing Southeast Asia intensively for twenty years, and Angkor for ten, producing many books on the art history and architecture of the region.... He is also the author of the Guide to Khmer Temples in Thailand and Laos, and was the first photographer to have prolonged access to Angkor after the country’s two decades of war, genocide and civil war (1999). In short, it would be extremely difficult to find two men more qualified to speak on the Stegosaurus carving at Ta Prohm. Of major significance is the fact that the authors view the carving as authentic, with absolutely no hint of forgery surrounding it. Patina is still obvious in the recesses. The depth of relief on the carvings that cover every square inch of this column, is more than half an inch. Removing the imagined “original” carving would have left a recessed surface. Then, carving the stegosaur on the recessed surface would require still deeper recesses. The above photograph clearly demonstrates that the carving is not recessed. It is flush with the other carvings. Since the plates on the back of the stegosaur protrude from the recessed background at least half an inch, it would not be possible to add them to the background by subsequent carving. The plates are an integral part of the rock surrounded by a recessed, patina covered background. There is approximately 40 feet of overburden that would have been displaced in order to replace the entire block. The blocks are held together, not with mortar, but with iron “staples” in the shape of a capital “I” typically about 8 inches long, 1.5 inches wide and 3/8 of an inch thick. An inset in the shape of the staple was carved into the surface of two adjoining blocks, across the abutment, one end in one block and the other end in the other. With the staple in the shaped recess, the next tier of blocks holds the staple in place. They are used horizontally and vertically.... However, the point that we are making here is that the blocks are interlocked in such a way that removing and replacing a block with 40 feet of overburden without detection, is an imaginary idea that will not work (Patton, 2006). 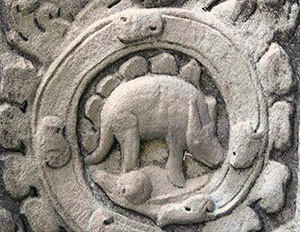 The primary objection, then, that this carving does not depict an actual Stegosaurus is not that it is a fake, but that the creature it depicts is not a Stegosaurus. Joseph Meert, in his blog dedicated to “refuting” young Earth creationism, commented about the carving: “I thought it was a wild boar” (2007). He further commented: “The problem with the carving is that it does not really look like any modern or fossilized animal. That makes it more likely that it was some drug induced illusion (sort of like the rest of young earth creationist ideas! )” (2007). Another skeptical author wrote: “Could it be that the so-called plates are in fact just a decorative tree or a bush-type embellishment (the trunk is located underneath between the front and hind legs) located right behind the creature and nothing else? Could be!” (“The Stegosaurus Carving...,” 2007). The prima facie fallacy of these kinds of objections is the simple fact that the carving does not look like a wild boar or a decorative tree, but does, in fact, look very similar to a Stegosaurus. A class of third graders could easily attest to that fact. In reality, it takes a massive amount of creative imagination to make the carving look like something other than a Stegosaurus. After showing a picture of this carving to a middle school class for the first time, all 10 of the students in the class identified the animal as a dinosaur or specifically a Stegosaurus. Why is the carving even posted on the Internet if it looks like nothing more than a wild boar or a creature with bushes behind it? That the carving is posted and being discussed at length verifies that there is something extremely unique about it. A few skeptics have based their objections on anatomical differences between popular Stegosaurus restorations and the Cambodian sculpture. The fact that the average Jr. High student immediately identifies the sculpture as a Stegosaurus is considered of no consequence. ‘The head is too large. Stegosaurs had no horns or frills on the head.’ The sculpture has no spikes on the tail... 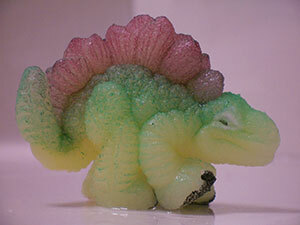 Therefore, they conclude that the sculptor never saw a Stegosaurus (2006). 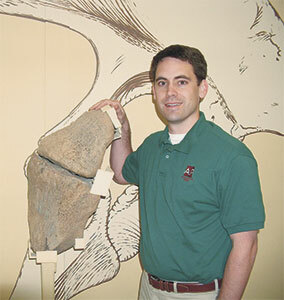 In an article titled “Rediscovering the Dinosaurs,” Ned Potter noted that “Pittsburgh’s Carnegie Museum of Natural History has one of the world’s leading collections of dinosaur fossils” (2007). The newsworthy event pertaining to this huge dinosaur fossil collection is the fact that “the Carnegie staff has decided to dismantle—and rethink—its entire collection” (2007). Because of the rapid rate at which new fossils force paleontologists and museum curators to alter their old ideas, it is becoming evident that entire dinosaur collections have been pieced together incorrectly. Experts interviewed for the article noted that dinosaur bones “don’t come with instruction manuals.” “When the Carnegie museum in Pittsburgh opens its new dinosaur wing later this year, the skeletons will be posed as scientists believe they would have looked eons ago” (2007, emp. added). Admittedly, however, “[Y]ears from now, as scientists learn more, they say they’ll probably have to change the exhibit all over again” (emp. added). 45.3% of the dinosaur genera are represented by only a single specimen, and 74.0% have five specimens or fewer. Only 20.3% are based on essentially complete skulls and skeletons, and 56.8% include complete or partial skulls. Limited material often makes the convincing definition of variational biological species difficult (1990, 87:7608). Dodson explained that many of the dinosaurs we commonly see on movies or in magazines are constructed from very scant fossil remains. In regard specifically to Stegosaurus fossils, Dodson lists the top ten dinosaurs with the most articulated specimens found of their kind—of which Stegosaurus is not one. He listed the 10th place dinosaur as having 40 specimens available, which would mean that the Stegosaurus is represented by fewer specimens than that. So, how many Stegosaurus skulls have been found? Finding the actual number is increasingly difficult. Various scholarly books, articles, and journals have little or nothing to say about the number of fossils available for each kind of dinosaur. After making a personal call to the American Museum of Natural History, a researcher from the Fossil Amphibian, Reptile, and Bird Collections division sent an e-mail with his results, in which he stated: “Only three complete Stegosaurus skulls are known. Additionally there are four almost complete skulls of Hesperosaurus thought to be referable to Stegosaurus as the skulls are indistinguishable. There are also 24 other incomplete skull specimens” (2007). Thus, it seems there are only three complete skulls and 28 partial skulls, many of which could be composed of only a few fragments of jawbone or teeth. When one considers the numerous replicas of Stegosaurus in museums all over the world, such limited numbers of complete fossilized skulls do not elicit total confidence in our present-day anatomical knowledge of Stegosaurus. Could it be that certain species of stegosaurs not represented by the few extant skulls had larger heads like the one in the carving? 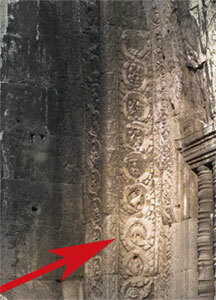 There exists another, probably more likely, explanation regarding the carving’s appearance. Patton commented: “The relevant question is not, Can you find anatomical differences with today’s popular restorations? Rather, the real question is, What kind of sculpture would be produced by an artist who remembered seeing a Stegosaurus?” (2006). He further commented: “Assuming the sculptor did not have a Stegosaurus trained to pose as a model, and there was no access to the internet, the rendering would most likely be from memory. Would the results of this process necessarily be anatomically correct compared to today’s restorations? What would it look like?” (2006). country would identify the creature as a Stegosaurus. The simple truth is, the unmistakable carving of a dinosaur at the Ta Prohm temple near Siem Reap, Cambodia, testifies to the one-time cohabitation of dinosaurs and humans. Finding an ancient picture of a dragon, minotaur, or alien-looking creature and assuming it is in reality what people saw is an incredibly ignorant thing to do. This applies to creationists who try to maintain people of 4,000 years ago cavorted with dinosaurs, but also to atheists who attempt to explain the origin of life by claiming aliens seeded the planet with DNA packets. There is no evidence for either of these proposals, and neither of them has any historical support” (2007, 34:4. emp. added). A major problem arises, however, when those such as Clayton attempt to lump “dragons” in with other creatures such as minotaurs or aliens. No physical evidence is available to verify the existence of the minotaur. Furthermore, the laws of biology preclude even the possibility of such. We do not believe the ancients saw minotaurs because we do not believe there ever were minotaurs. The situation with creatures that look like dinosaurs is much different. Everyone involved in the discussion believes that huge reptiles once roamed the Earth. The question is not did huge reptilian creatures that match the ancient carvings exist; the question is, did they exist with humans? Dinosaurs are not imaginary creatures dismissed by reputable sources. Their bones have been found, fossilized nests uncovered, and their skin impressions studied. Millions of dollars every year pour into dinosaur research. If thousands of minotaur fossils had been found, some of them very close to the carvings that depict creatures that looked just like minotaurs, minotaurs could not be dismissed as imaginary creatures, and the carvings and drawings could not be dismissed as depictions of imaginary creatures. The difference between art depicting minotaurs and art showing dinosaur-like creatures is that everyone knows dinosaurs existed—that is not up for debate. On the underside of the third largest natural bridge in the world (Kachina Bridge), several petroglyphs and pictographs exist, which rock-art experts believe to be anywhere from 500 to 1,500 years old. The carvings are believed to be the work of the Anasazi Indians who once lived in that area of southeastern Utah. A mountain goat, a human figure, multiple handprints, and many other carvings and drawings can be seen quite easily underneath the bridge on both sides of the span. The most fascinating piece of rock art at Kachina Bridge, however, is the petroglyph of a dinosaur, located to the right of the span, about 10 feet from the ground. This figure, which is carved into the rock, has a long, thick tail, a long neck, a wide midsection, and a small head. Any unbiased visitor to Kachina Bridge would have to admit that this particular petroglyph looks like a dinosaur—specifically Apatosaurus (more popularly known as Brontosaurus). 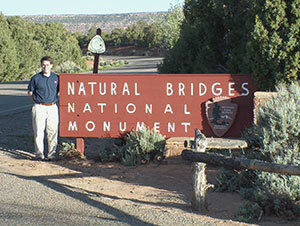 In May of 2004, after examining this petroglyph firsthand and taking many pictures of it, as well as of the surrounding rock art, we visited the Natural Bridges National Monument visitor’s center where we spoke with one of the staff members. Upon informing the Natural Bridges assistant that we had just hiked down to the base of Kachina Bridge, she immediately asked if we saw the petroglyph that resembles a dinosaur. We acknowledged that we had, and then asked her how “they” explain such an anomaly? (If, according to evolutionary scientists, humans never lived with dinosaurs, how did the Anasazis, who inhabited southeastern Utah from A.D. 500 to 1450, carve such an accurate picture of an Apatosaurus onto the side of a rock wall?) Her response: “They don’t really want to explain it.” After being politely pressed for more information, she indicated that the petroglyph was carved too early to be a horse, because the Anasazis did not have horses. She also commented that some people actually think it really is a picture of a dinosaur, but “they are crazy.” She further explained that there are petroglyphs that resemble mammoths around this area. So the petroglyph at Kachina Bridge may be just “some monster” that the Anasazis carved onto rock. The only other animal that the staff member at Natural Bridges National Monument seemed to think that the petroglyph in question could have been was a horse. But, according to her own testimony, the Anasazi Indians were a horseless people. (Spanish settlers did not introduce the horse to America until the 16th century.) Thus, she concluded the petroglyph is simply some kind of monster. This “monster,” however, looks exactly like the scientific reconstruction of the large sauropod dinosaur known as Apatosaurus. It is no wonder that this woman earlier admitted that scientists “don’t really want to explain” this petroglyph. They do not want to deal with it, because they cannot find a logical way to explain it. 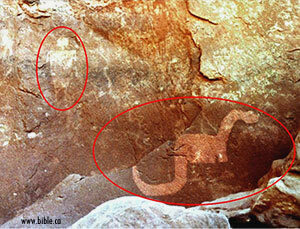 Color has been enhanced in this photo of the Natural Bridges petroglyph to show the dinosaur shape more clearly. Interestingly, no one with whom we spoke about the petroglyph, nor any reputable writer whose works we have consulted on the matter, has challenged the authenticity of the petroglyph. In fact, two well-known rock-art experts have written about this particular petroglyph, and neither has suggested that it is a modern-day forgery. Francis Barnes, an evolutionist and widely recognized authority on rock art of the American Southwest, observed in 1979: “There is a petroglyph in Natural Bridges National Monument that bears a startling resemblance to a dinosaur, specifically a Brontosaurus, with long tail and neck, small head and all” (Barnes and Pendleton, 1979, p. 201, emp. added). Barnes also pointed out that other animals, such as impalas, ostriches, and mammoths, are seen on rock-art panels in the Southwest, that either have been long extinct in the Western Hemisphere or were thought to have never been there at all. “Such anomalous rock art figures can be explained away,” wrote Barnes, “but they still tend to cast doubt upon the admittedly flimsy relative-time age-dating schemes used by archaeologists” (p. 202). More than 20 years later, evolutionary geologist Dennis Slifer wrote about this petroglyph in his Guide to Rock Art of the Utah Region. At the base of Kachina Bridge are approximately one hundred elements, both petroglyphs and pictographs, dating from A.D. 700-1250. These include a series of red handprints and a large red butterfly-like figure, spirals, bighorn sheep, snake-like meandering lines, a white pictograph of a chain-like design, and some geometric petroglyphs.... One of the most curious designs is a petroglyph that resembles a dinosaur, which is apparently of Anasazi origin based on its patination (2000, p. 105, emp. added). Following these comments, Slifer included a diagram of the petroglyph in question—the illustration looks exactly like a dinosaur (specifically, some kind of large sauropod). 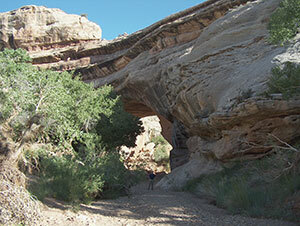 Both Barnes and Slifer know that the dinosaur petroglyph at Natural Bridges National Monument shows every sign of age. One can be sure that, if there were any orthodox way to explain it away, they would have attempted to do so. In fact, earlier in his book, Slifer did not hesitate to state his systematic objections to another particular piece of rock art that some have asserted is a pictograph of an extinct pterosaur (see pp. 59-63). 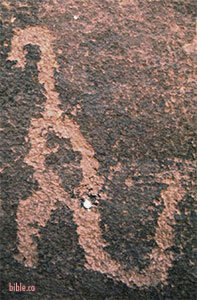 The petroglyph at Kachina Bridge, however, was not, and could not, be explained away in any logical fashion. Eric stands beside Apatosaurus hip fossils in Blanding, Utah. the Anasazi Indians? How about Apatosaurus fossils in the surrounding area? If apatosaurs had ever lived in the area, then that would lend credence to the idea that the Anasazis had seen them. Interestingly, just 45 miles from Natural Bridges National Monument, in Blanding, Utah, two actual Apatosaurus hip fossils are displayed. The bones were found in the 1960s in the Blanding area—less than 50 miles from the Apatosaurus-like petroglyph at Natural Bridges National Monument. An ancient petroglyph that looks just like an Apatosaurus, with bones from the very same type of animal, found within 50 miles of the carving. Taken together, this type of evidence presents an impressive case for the coexistence of dinosaurs and humans. On two occasions in the late 1800s, Dr. Samuel Hubbard, Honorary Curator of Archaeology of the Oakland Museum, visited an area of the Grand Canyon known as the Havasupai Canyon. 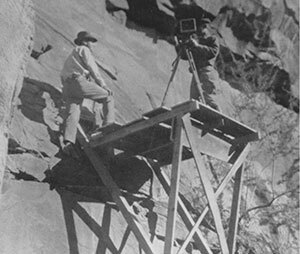 Hubbard observed many curious inscriptions on the canyon walls during these trips. Though the significance of the pictographs and petroglyphs was not fully recognized early on, “[e]ndeavors were made at various times to interest scientists” to view the artwork (Hubbard, 1925, p. 5). Finally, in the fall of 1924, Hubbard, a theistic evolutionist (cf. pp. 37-38), made his third trip to Havasupai, this time accompanied by several men, including renowned paleontologist Charles W. Gilmore, photographer Robert Carson, and the oil tycoon who sponsored the expedition, E.L. Doheny. Supplementing the pictures of ibex from the Supai Canyon...I have received other ibex pictures from Nevada, Oregon, Utah and Arizona. I am therefore forced to the conclusion that this must have been a very common animal at one time inhabiting the whole Rocky Mountain region. It was probably such a favorite game of the prehistoric hunters that they finally exterminated it (p. 27). Indeed, “[t]hese drawings would seem to indicate that they must have been a common animal in the Grand Canyon region” in the distant past (p. 17). After all, how could the ancients have inscribed such accurate pictures of them, if they had never seen them? On one particular rock wall in the Havasupai Canyon, just above a group of ibex inscriptions, is a carving of an elephant. “The remains of elephants are very common all over North America”—from Alaska to Mexico (Hubbard, 1925, p. 15). Furthermore, as noted earlier in our discussion of the Natural Bridges rock art, inscriptions that resemble elephants or mammoths are not unusual in the West. Undoubtedly, elephants once roamed North America. Consider, however, the implications of elephant and mammoth rock art. For the ancients to have drawn images of these massive creatures with long trunks, it is reasonable to conclude that, as with the ibex, Native Americans must have seen elephants. Interestingly, the inscriptions at Havasupai show an elephant striking a man with its trunk (see Hubbard, 1925, pp. 12-13; see also Hubbard, 1926, 26:13). The fact that some prehistoric man made a pictograph of a dinosaur on the walls of this canyon upsets completely all of our theories regarding the antiquity of man.... The fact that the animal is upright and balanced on its tail would seem to indicate that the prehistoric artist must have seen it alive (pp. 5,7, emp. in orig.). Evidence “that dinosaurs were in the vicinity, is proved by the tracks...which were identified by Mr. Gilmore [a vertebrate paleontologist and renowned dinosaur fossil hunter—KB/EL] as belonging to one of the carnivorous dinosaurs” (p. 9). According to Hubbard, “These tracks were in the ‘Painted Desert’ not over 100 miles from the picture” (p. 9). Once again, we have a carving of an animal that looks more like a dinosaur than any other animal, living or extinct. What’s more, all of the evidence points to the carving being genuine. Finally, fossil footprints prove that dinosaurs once lived in the same general area of the dinosaur-like rock art. 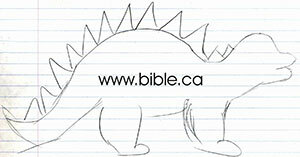 Yet again, we ask: How could man have drawn such an accurate picture of a creature he supposedly never had seen? The fact is, man once lived with dinosaurs, and the carvings at Cambodia, Natural Bridges, and Havasupai serve as strong evidence of their cohabitation. American Museum of Natural History (2007), Personal e-mail, November 15. Barnes, F.A. and Michaelene Pendleton (1979), Canyon Country Prehistoric Indians: Their Cultures, Ruins, Artifacts and Rock Art (Salt Lake City, NV: Wasatch Publishers). Clayton, John (2007), “What is Reliable History and What is Not?,” Does God Exist?, 34:3-7, July/August. Dodson, Peter (1990), “Counting Dinosaurs: How Many Kinds Were There?,” Proceedings of the National Academy of Sciences, 87:7608-7612, October. Freeman, Michael and Claude Jacques (1999), Ancient Angkor (Trumbull, CT: Weatherhill). Hubbard, Samuel (1925), Discoveries Relating to Prehistoric Man by the Doheny Scientific Expedition in the Hava Supai Canyon (San Francisco, CA: Sunset Press). Hubbard, Samuel (1926), “African Lions Roamed in Hollywood,” The Dearborn Independent, 26:12-13,22, June 19. Jacques, Claude and Michael Freeman (1997), Angkor: Cities and Temples (Trumbull, CT: Weatherhill). Lyons, Eric (2007), “Historical Support for the Coexistence of Dinosaurs and Humans [Parts I&II],” Reason & Revelation, 27:65-71,73-78, September-October, [On-line], URL: /articles/3449. Meert, Joseph (2007), “Wild, Wacky World of Answers in Genesis” [On-line], URL: http://scienceantiscience.blogspot.com/2007/01/wild-wacky-world-of- answers-in-genesis.html. 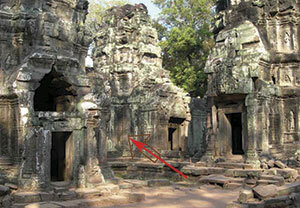 Patton, Don (2006), “Dinosaurs in Ancient Cambodian Temple,” [On-line], URL: http://www.bible.ca/tracks/tracks-cambodia.htm. Potter, Ned (2007), “Rediscovering the Dinosaurs,” [On-line], URL: http://www.abcnews.go.com/Technology/story?id=3027863&page=1. Slifer, Dennis (2000), Guide to Rock Art of the Utah Region (Santa Fe, NM: Ancient City Press). “The Stegosaurus Carving that Isn’t” (2007), [On-line], URL: http://dinocreationistsfairytale.wordpress.com/2007/01/19/the- stegosaurus-carving-that-isnt/.